During adolescence there are a number of cognitive, emotional, physical and attitudinal changes that provide the basis for personality development. Teenagers are in an important transition stage where they naturally try to break free from their parents and instead seek out new ways of doing things for themselves. For the first time, teenagers will start to view their friends and peers groups as more important and influential than their parents – often leading to conflict. However difficult, teenagers need to be given the time and space to make decisions for themselves and learn from their errors. Although we may worry about their choice in friends, these self-built relationships can actually help them develop skills such as empathy, sharing and leadership, as well as having a positive impact on them in terms of academic motivation and aspirations. Maintaining an open dialogue is important at this age and it is crucial your child feels able to talk to you about their new experiences and concerns. Due to all these changes it is easy to forget that teenagers still need time to play and have fun! Teenagers may not call it play, but the time that they spend with their friends or on their own, without being told what to do, is their version of play. 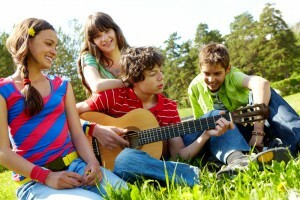 Teenage play is predominantly social and they have the freedom to decide for themselves or as a group how to have fun. Analysis of teenage behaviour during play shows that their behaviour mimics and practices being an adult, which is a positive for their development. However, it is still important as a parent to hold a discussion with your child to set clear boundaries e.g. controls on the internet and phones, so that they can grow and explore their identity but still within a safe environment. Adolescents may have grown out of some of their favourite traditional toys but that doesn’t mean they want to stop playing! 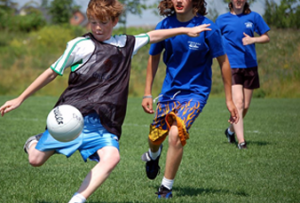 Sport is a great way of keeping an elements of play in the life of a young adult, and if they keep engaging in sport through their adolescence they will be more likely to be active throughout the rest of adulthood. Youth clubs and community groups are also great for giving teenagers the opportunity to spend time together and to choose what they want to do with their time. This can increase confidence, especially as by now most will know their own interests, likes and dislikes. A recent survey shows that having a space where they can go to spend time with their friends is the main thing that children and young people say would make their lives better. Try to still spend a bit of time playing as a family, making time to have fun together will help keep the family bonded and working in a happy and healthy way. It also provides a prime opportunity to discuss things in a safe, family environment. Some families have a games night once a week or fortnight for the whole family to get together over a board game!